At Factor[e], where I work, we're a cycling office. Even on a cold, snowy day, there is still a bike hanging on our wall of bike racks. This is not an uncommon site in many knowledge worker offices, especially within the design and tech industry. When I mention this to people not in the industry it tends to elicit an "oh you crazy creative people" response, but there's more to it than this. In the Canadian job market stats from 2014, 36.8 percent are "Millennials" (Generation Y), born between 1980 and 1999. They're the best educated, technically savvy generation yet and unfortunately some of the poorest. Many graduated into a stagnant or recovering economy after paying inflated tuition rates and are now saddled with massive student debts. With not enough income and massive debts, taking that big adult step of buying your first home is even further away with our soaring real estate market and the bidding wars that jack up prices. Many Millennials are not able to live the lifestyles their parents lived at or before their age. With all these factors in play, they are one of the first generations to not really care about car ownership. When you purchase a car, it depreciates in value as soon as you drive it off the lot (with the exception of vintage cars). Though car payments, insurance and gas can be manageable payments to make, it's the repairs that cause people to dip into savings that may or may not be there to maintain something that doesn't grow in value. For many Millennials, it makes more financial sense to live within the city where walking, cycling or using public transit are more financially sound options. As someone who commutes by bike or bus regularly for this very reason, a very big chunk of the visible demographic in the bike lanes and on the bus are Millennials commuting to their jobs. If we examine future projections for the workforce, the U.S. Bureau of Statistics shows big growth in the Science, Technology, Engineering and Math (STEM) fields: 34.5 percent job growth in healthcare support, 25.9 percent in healthcare practitioners and technical occupation,s and 22 percent in computer and mathematical occupations, to name a few of the highest growing areas. Canada's statistics follow much the same STEM-heavy job growth pattern. We will need to be ready to welcome STEM businesses who employ this ever-growing population of tech-savvy Millennials, some of their predecessors from Generation X and the next wave of graduates seeking jobs from Generation Z. Knowing that this growth is coming, it absolutely baffles us that Hamilton still continues to see economically viable, alternative sources of transit as "fringe". We have city councillors seeking to kill or prevent projects that would take away any lanes from cars to create space for bikes and public transit, despite great results for projects like Hamilton Bike Share (we sponsored the hub outside our office!) and the Cannon Street cycle track. We absolutely cannot afford to have this detrimental attitude when we have the space to welcome this wave of STEM knowledge workers, comprised of those tech-savvy, car-less millennials. Toronto is already an expensive place to establish an office and they won't be able to accommodate everyone's needs; companies will be looking for affordable office space to set up shop in surrounding communities. Kitchener-Waterloo, an already reputable tech-focused area, got the memo and has already implemented bus rapid transit (BRT) with light rail transit (LRT) on track to open in 2017. In 2014, after receiving a city staff recommendation to iterate and improve our pilot BRT-lite project with available funding, City Council opted to kill it instead. Ward 6 Councillor Chad Collins remarked that killing the project would be "an early Christmas present" to the city. We are currently projected to begin construction on our LRT in 2019, two years after Kitchener/Waterloo is finished phase 1 of theirs. If we want our economic development to thrive, we need to change our attitudes fast and accept that the future of our workforce needs alternative methods of transportation. We are not the only alternative to Toronto and other communities have already jumped ahead of us in this regard. Cities all across America are re-thinking their transit infrastructure to attract young, talented knowledge/creative employees - and it's working. Will Hamilton open its arms to this change or cling to outdated thinking to protect the "drive-thru city" status quo at the detriment of our growth? I certainly hope we won't let this fantastic opportunity pass us by. This article was first published on the factor[e] blog. Meg Smith works as a senior designer at Factor[e] in Hamilton. Great article! Hamilton has managed to achieve so much success despite the stagnant council - imagine what the city could look like if council actually supported alternative modes of transportation. Although the article is essentially correct, Waterloo's BRT is really a "BRT Lite System". 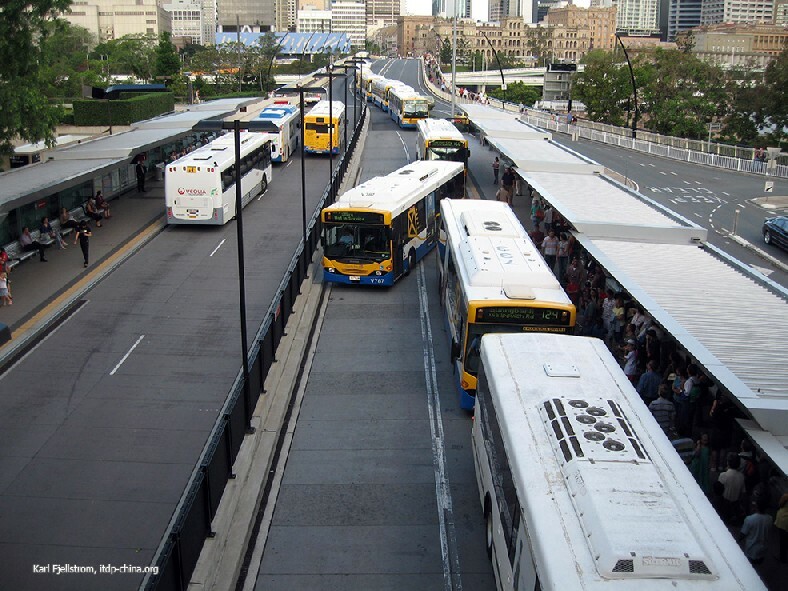 This is a phenomena that has taken over much of the BRT planning in North America. Where it is really an express bus that has been given a marketing name and really nice high tech bus stops, spaced further apart than the normal stops on the route. They might have a few of BRT other features as well. Unfortunately, the system's actual capacity is also very "lite" compared to true BRT. In K-W its given names such as "Adaptive Bus Rapid Transit" where there might be a bus lane here or there as well as a few signal controlled intersections. But not a truly segregated right of way with designs that actually facilitate true BRT capacity and BRT service. Its professionally frustrating to see these so called "BRT Lite" systems called BRT because it makes proposing real BRT, that much more difficult. It's one thing for a politician to call them a bus system that runs like an inexpensive LRT line but if your transit experts start saying that, more than once and truly believe it, run for the hills! True BRT is a very different animal than LRT and can do things that most LRT systems simply just can't do. Also, BRT should not operate like a railway most of the time if you want it to succeed. The illusion that BRT and LRT look similar and therefore operate similarly, is just that, an illusion. Anyway my rant is finished now, have a great day! Here is an excellent video describing a real BRT system. It is important that we benchmark these world-class systems. The real issue is how successful these systems get and what that means for the city its in. One of the problems of using the examples of Latin America or China with BRT is that their driver and operational cost structures are quite different than ours. Its true their systems move a lot of people, there is no denying that. The problem with BRT when it really does start moving a lot of people in an operating environment like a the First World (N. America, Western and Central Europe, Japan, Australia...) is that operating costs start going through the roof. 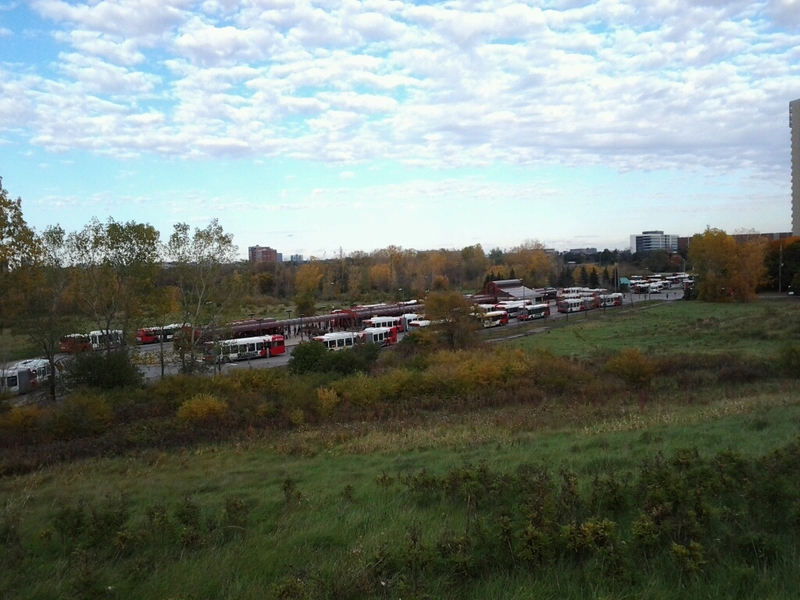 In Ottawa and Brisbane for example, levels of 185-200 buses/hour/direction (10700 passengers/h/d) in Ottawa and 210-240 buses/h/d (13000-14000 passengers/h/d) in Brisbane, are quite common at peak. This has the effect of driving up operating costs to the point especially in Ottawa, were now a $725 Million, 2.5 km LRT tunnel becomes good deal because it will help massively reduce operating costs (a minimum of $60 Million a year) for OC Transpo over the long term and incredibly simplify transit operations. Not to mention when the systems start moving these levels of crowds the stations out of need become very large and are not very pretty anymore. Many downtown businesses do not want to be located near them. Even Curitiba Brazil, grand daddy of all modern BRT systems is building a rail transit line in the core of the city partly due to the operating cost of the BRT system. Excellent article. Similar observations have been made in business magazines, such as The Economist, but it takes a long time for the message to get through. Giving a local, personal perspective is very useful. I hope Council realizes that excellent transit, pedestrian services, and bike infrastructure are competitive advantages in today's economy. And they are extremely prudent investments in attracting new business since they don't require servicing new greenfield business parks, providing expensive tax breaks and subsidies and taking on new infrastructure burdens. "transit is not a credible alternative > fewer people ride it -> we won't invest in it -> service is poor --> transit is not a credible alternative"
Given the shift away from driving generally in the younger generations it is shocking that HSR has much worse service, fewer buses and drivers than it did 30 years ago when Hamilton's population was much smaller. And it is embarrassing that HSR is seeing essentially no ridership growth when ridership has up to doubled over the last six years in neighbouring municipalities. LRT will make a huge difference, but Council has to increase their contribution and not just rely on fares and the province to fund improvements. Improving transit would also go a long way to addressing our infrastructure deficit, where road construction and maintenance is by far the largest single expense. the area rating issue is very frustrating. i can empathize with individuals in flamborough, for instance, in their argument as to why they should pay for transit they will not have service for (ignoring the fact we all pay for everything else like massive lane extensions etc., but that's a can of worms). by getting rid of area rating i think a lot of barriers to expanding service both in terms of volume on existing routes and to new routes would be resolved. i don't think blaming the lack of transit on councilors of the suburban wards really is helpful. we need to view the city and it's people as a community. piecemeal planning by ward is expensive and would create a fragmented system. not to mention that participation rates for municipal elections is low, seeing as how low income individuals have a lower participation rate than average anyways for numerous reasons i don't feel their voices are represented in government. i can agree that seeing a working system would help people consider switching. i can only hope that the city diverts resources no longer needed due to LRT to servicing some of the awful mountain routes, rather than the more likely hamilton thing to do which would be to just place that money elsewhere. Current generation of young Canadians wealthiest ever: federal study. David Macdonald, a think-tank economist with the Canadian Centre for Policy Alternatives, says the finding of greater wealth among all youth is accurate — but much of that asset accumulation is happening only among the already wealthy. "You need to be very careful of which youth are driving this trend," he said after reviewing the Finance Department report and comparing it with his own study from last June. "As with other inequality trends, it's the high end that's driving up net worth for those in their 20s or 30s. The dramatic increase in net worth across almost all age groups since 1999 has been incredible for the top 10 per cent in those groups but a disaster for wealth inequality compared to say middle-class youth." "Of all the wealth held by those in their 20s, 70 per cent is held by the top 10 per cent and the bottom 70 per cent hold one per cent of that wealth." The Finance Canada report does acknowledge that younger wealth appears to be distributed unequally, with "stronger wealth gains at the top of the income distribution." The bottom 70% of the people hold one percent of the wealth. The Gilded Age has got nothing on us! As Piketty points out, in most societies the bottom 50% have essentially no net wealth at all (assets minus debts). The innovation of the 20th century was a property owning middle class, and it is still true that for the middle classes almost all their wealth is in their principle residence. Wealth is far more unequally distributed than income. Although another innovation of the 20th century was "super managers" whose high incomes (rather than inherited wealth) has helped put them in the top 1%. Hey knowledge workers, want a ride? 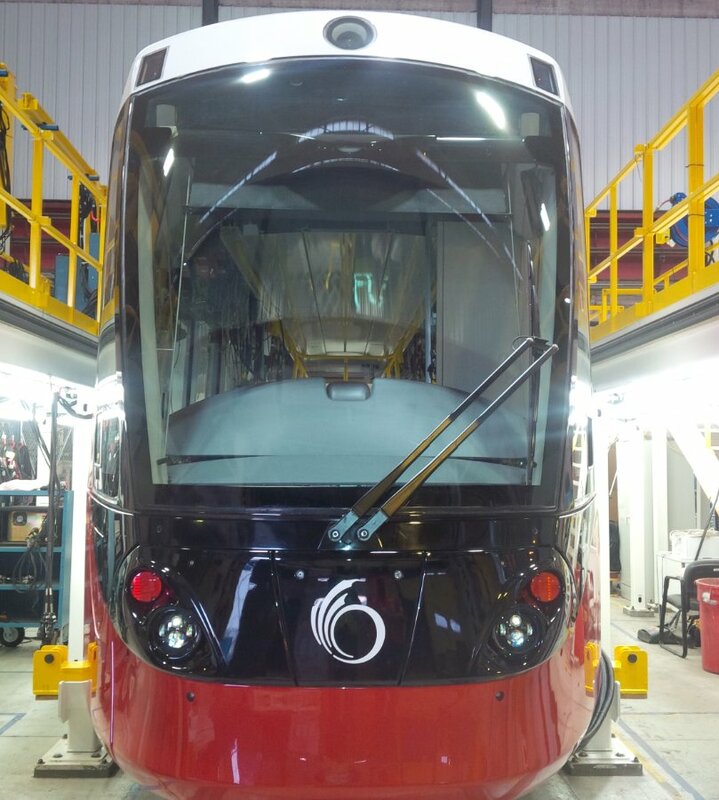 It's Ottawa's first LRV being assembled in Ottawa at Belfast Yard.